From the moment you pick up and feel the Prime Satellite, you are aware that never before have affordable satellite speakers offered this level of audiophile design, high-end components and precise build quality. Jets thunder through the sky. Bullets graze your ears. Prime Satellites simply outclass the tiny and tinny surround speakers that are more form than performer. Prime Satellites revolutionize surround speakers-in fact, they employ many of the same components as their bigger brothers in the Prime and Ultra lines. 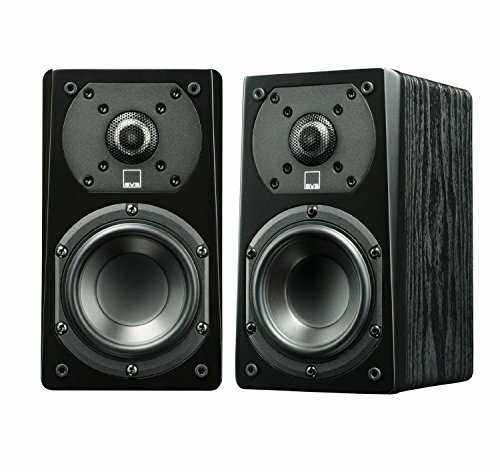 Strategically placed, they create awe-inspiring realism and seamless sonic transitions-front to back and side to side. When the lights dim and the score fades in they'll flood your room with high-end sonics and action. Painstakingly voiced and sonically matched, Prime Satellites are designed to melt in with SVS towers, bookshelves or in a system all their own for endless listening possibilities. Despite being small enough to fit into nearly any room and system, the overachieving Prime Satellite simply outclasses cheap HTIB speakers, packing the same technology, sound quality and performance as its bigger brothers in the Prime and Ultra lines. Available in premium-grade piano gloss black or handsome black ash finish, the Prime Satellite is not only handsome but functional too - with an integral keyhole bracket which allows for easy wall-mounting. Leveraging design and technology from the SVS Ultra family, the Prime Satellite features high-quality drivers and crossover components simply not found anywhere else in this segment: The 1" aluminum dome tweeter utilizes an FEA-optimized diffuser which delivers a very open 'airy' presentation and extremely unveiled highs. The 4.5" woofer delivers surprising bass response and punch, and features a polypropylene cone, an aluminum shorting ring for reduced distortion, a vented voice coil former, and unique all-new cast ABS-fiberglass composite basket for precise component alignment. The SVS SoundMatch 2-way crossover ties it all together with premium-grade capacitors, air-core inductors and heavy-trace printed circuit boards. Expertly refined topology ensures a smooth response and transition between drivers with excellent polar response and phase coherency for amazing imaging.